Artificial seasoning is the process by which lumber is dried using man-made devices such as a kiln. Regular wood seasoning is done by air drying in conditions below 18 percent moisture. There are multiple advantages to having wood artificially seasoned that relate to the quality, strength and cost of the wood. When you are using a natural drying process, you are at the mercy of the weather to give you ideal wood-drying conditions. This could take a lot more time and delay the sale or productive use of your wood. By using artificial seasoning with a kiln, you reduce the time necessary to dry your wood. This means that you can move it out quickly. 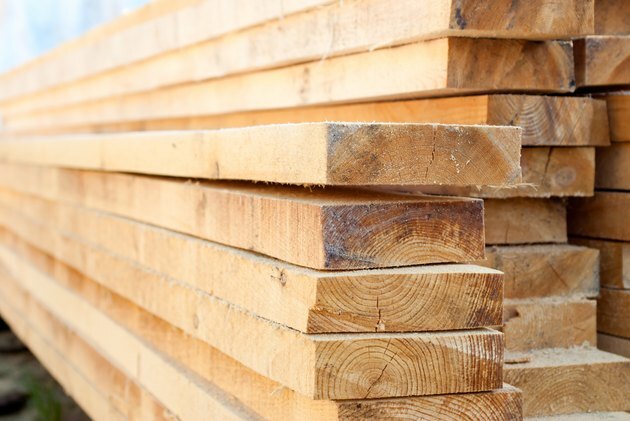 The time factor is especially important for large lumber companies. Saving time saves money by allowing you to sell your wood faster and to prepare room in your storehouse for more wood. Also, shipping costs are often directly related to the weight of shipments. If you have dried the wood and reduced the moisture content, your wood will actually cost less to ship. With the natural drying method, you cannot control the exact level of heat that you wish to use on your wood. Using artificial seasoning, you can adjust the temperature as you need to. This will allow you to prevent drying degrade, which can sometimes occur when temperatures are too high. Wood that has been artificially seasoned gains several qualities when it loses its moisture. Wood tends to increase in strength as it is seasoned. It is also easier to work with as it has less of a tendency to split, shake or warp. This means that the wood will be safer when it is used in machines. Also, when wood has high moisture, it is problematic to paint or varnish, but when it is seasoned, the paint job can be much easier. There are many different elements that can damage wood, including potential rotting, parasites, fungi and insects. Artificial seasoning will dry up the sap that creates an environment for fungi and parasites to live in. Also, the high temperatures used in artificial seasoning will kill most if not all of the living organisms that are in the wood. Lastly, lower moisture content will prevent the chance for dry rot or any other type of fungal infection in the wood.